It used to be the case that I would almost be told that my opinion was wrong and that Windows 8 was in actual fact a bag of balls, usually by people who had read about it but not used it for more than a few minutes in PC World (if at all). True, sometimes. On the train, taking notes in stand-ups, etc. 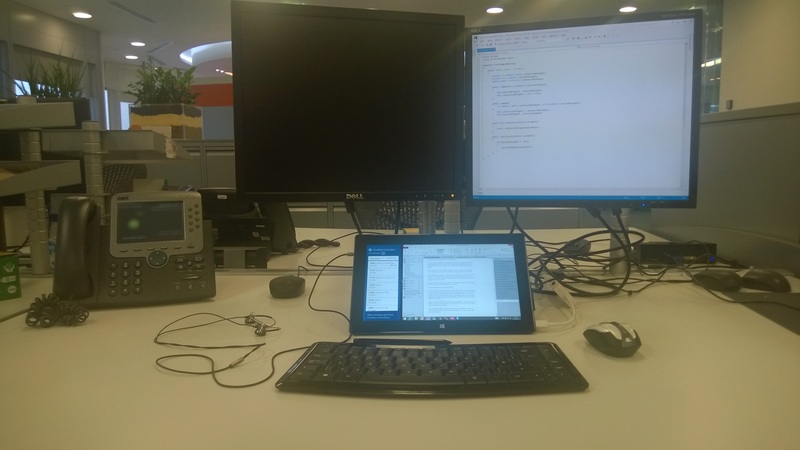 but mostly I use the surface as a regular set-up with mouse, keyboard and either one or two monitors connected. This is just a natural set-up for me, especially when doing productivity work or coding. I guess I use the surface in a conventional configuration about 75% of the time (if not more) as I’m mostly using it for, or at work. So how well does this set-up work for me? Fine. In fact I’m impressed with some of the multi-monitor control in Windows 8.1, although less impressed with some of the scaling issues on older desktop software, but it’s an irritant rather than a deal breaker. Other than that I’m happy to have the choice between modern and desktop apps. For me modern apps work well with a mouse, and if intelligently written the layout on a large monitor is used well. Again, I’ll say it’s not perfect, but it is as good as Windows 7 in many ways, and in others it’s better. But that’s just me, I went in not so sure but with an open mind as I like new shiny things. Oh, and all those additional cables and extra mice in the photo – there are multiple desktop only machines under my work desk. I’m not currently using them, why would I?